Winter* by Ali Smith: The second book in Smith's seasonal quartet is released on the 10th of November here in NZ and if it's anything like Autumn, shortlisted for the Man Booker Prize, it will not disappoint. Autumn was cleverly tailored to what was occurring around the world in 2016 so I expect Winter to follow suit. According to the blurb "it's the season that teaches us survival". The Crown, 1947-1955* by Robert Lacey: Season 2 of this Netflix gem returns next month, which I'm really pleased about. In the meantime, there's this volume, following the time period of Season 1 to look forward to. I've had a quick flick through this, curiosity got the better of me and it looks like it provides context to the events of each episode as well as insight from the show's creators. This is probably the kind of book for true fans of The Crown but it also serves as a refresher before the new season. Uncommon Type* by Tom Hanks: Yes, that Tom Hanks has written a short story collection and it's receiving glowing reviews. I was lucky enough to receive an advanced copy of this book and from the reviews I've read already, it sounds brilliant. Words laden with wisdom and charm, as is to be expected perhaps from Tom Hanks. Trying To Float* by Nicolaia Rips: This book was technically released last year but the paperback edition seems to have just made its way to our shores. Written by the author at seventeen, it chronicles life and the happenings of growing up in The Chelsea Hotel. According to ELLE magazine this is "Eloise meets Wes Anderson" which is my kind of comparison so my memoir-loving self is going to get to this very soon. The Mother of All Questions* by Rebecca Solnit: Kiran from Unity Books did an excellent review of Solnit's latest essay volume so go listen to that. Subtitled, Further Feminisms, it is a follow-up to her collection 'Men Explain Things To Me' which I highly recommend. Turtles All The Way Down* by John Green (not pictured): John Green's latest novel has been a long time coming and as someone who loves The Fault In Our Stars and Looking For Alaska, I was always going to be excited for this. It involves adventure, as two teens look set to solve a crime and locate a fugitive billionaire. It also touches on anxiety and mental health. I am actually reading this at the moment, albeit halfheartedly because I have far too many books on the go right now but I am enjoying it so far. The Grip of Film* by Richard Ayoade: Moss wrote another book! Well Richard Ayoade did. If it's anything like his last book it'll be a bit perplexing but in a way fans can appreciate. In case the title doesn't give it away, Ayoade talks all things film through the voice of Geordy Lashore. Side note: If that doesn't sound like a troll's alias name, I don't know what does. Either way I expect this to be very entertaining. Me You: A Diary* by Dawn French: Wreck This Journal for the adults, interwoven with Dawn French's own insights and anecdotes each month. This is a fun, interactive type memoir and I'm seriously looking forward to using this next year. If only for the fact I get to spend each month with Dawn French in some capacity. 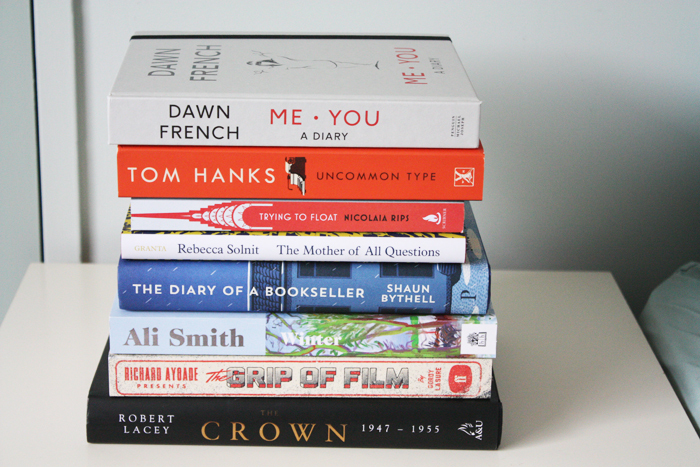 The Diary of a Bookseller* by Shaun Bythell: I love diaries, they satisfy my inner curious cat so much. This one follows the owner of a secondhand bookstore and from the brief excerpt I've read thus far, it's charming and insightful. Definitely a book for a cosy weekend or trip away.